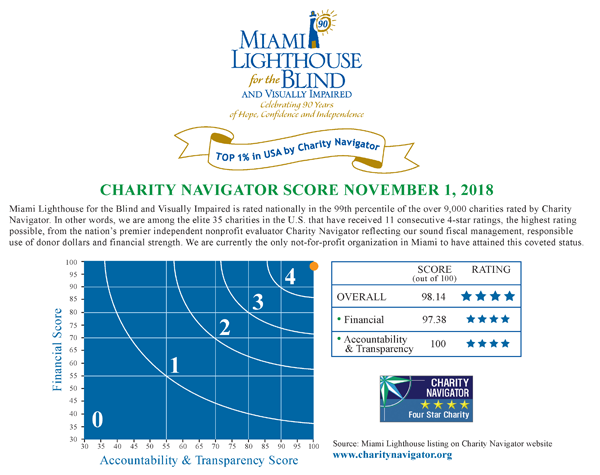 Miami Lighthouse has received eleven consecutive 4-star ratings, the highest rating possible, from the national evaluator Charity Navigator placing us in the top 1% of nonprofits in the nation. Miami Lighthouse is currently the only the only not-for-profit organizaton in Miami achieving this highly coveted status. After a comprehensive review, our overall score was 98.14 out of 100 based on our sound financial management, accountability and transparency. At the Lions Clubs International 100th Anniversary Board of Directors Meeting in Miami, President & CEO Virginia Jacko was presented by Lions International Chair, Dr. Naresh Aggarwal, the highly selective 2018 President's Leadership Award. The Able Trust named our President & CEO, Virginia Jacko, as the winner of this year's prestigious "Dr. George L. Spelios Leadership Award." This highly competitive award recognizes outstanding leadership and advocacy efforts of an executive director or president of a Florida non-profit disability organization. To read more click here. Miami Lighthouse was named "Best of Miami" Charity 2017 by Miami New Times. "Last year, a WalletHub survey ranked Miami one of the least caring cities in the United States. How did the Magic City measure so poorly? According to WalletHub, its researchers found a distinct lack of volunteerism and car-ing for the vulnerable, suggesting Miamians are perhaps a bit self-centered. But it's never too late to change that perception, and there's no better place to begin than at Miami Lighthouse for the Blind, one of the city's oldest charitable organizations serving the visually impaired. And though not eve-ryone has deep pockets to make a considerable donation, Miami Lighthouse offers other ways for people to help. Simply fill out a volunteer application on its website to help with everything from children's programs to vision screenings and fundraising. Because Miami Lighthouse has a four-star Charity Navigator rating, volunteers and donors can trust that their time and money will be well spent." Early Intervention Blind Babies Program Named the Children's Trust 2016 Program of the Year! This most prestigious award recognizes this Early Intervention Program, in particular, for including parents as teachers. To view the video about the program click here. 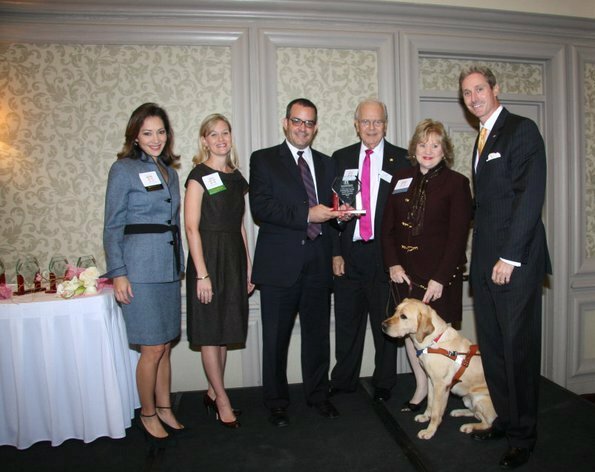 Miami Lighthouse for the Blind and Visually Impaired – the oldest private agency in Florida serving the blind – received two major awards in 2015. A Sapphire Award from Florida Blue Foundation acknowledged it as an outstanding nonprofit community healthcare organization; the Beacon Council’s Distinguised Industry Award honored it for outstanding contributions to education. In recognition of these tributes, Miami Today’s Gold Medal Award judges have given Miami Lighthouse the 2016 Silver Medal for an Organization. 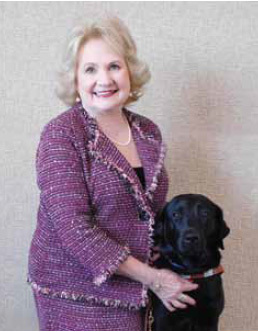 From its beginnings in 1931, in a 900-square-foot bungalow, the nonprofit has grown to a 55,000- square-foot, state-of-the-art educational and rehabilitation center serving the blind and visually impaired at every stage of life, says Miami Lighthouse President and CEO Virginia A. Jacko. “We have a major expansion under way,” says Board Chair Ramón F. Casas, “that will include full-service daycare and pre-kindergarten for blind children in collaboration with Miami- Dade County Public Schools and the Early Learning Coalition. We’re already offering intervention from birth, but now we’ll be able to do so on a daily basis. President and CEO Virginia Jacko has strengthened Miami Lighthouse. Daily instruction in Braille, math and using an iPad, Ms. Jacko says, will ensure that when the children enter the public school system “they will have all the skills they need for a level playing field.” Miami Lighthouse’s four mobile eyecare units provide free eyecare exams and glasses for kids having trouble at school due to impaired vision but whose parents can’t afford eyecare services. “A survey of the parents of 1,400 kids assisted in that program showed the 74% had academic proof that their child’s performance had improved by getting glasses from us at no cost,” Ms. Jacko says. As children enter their teens, Miami Lighthouse focuses on preparing them for employment. “We’re helping them do whatever they have to do to be ready for a career – such a getting them job-shadowing opportunities as well as jobs during spring break,” Ms. Jacko says. Numerous challenges face those who lose their vision as adults – a group that is growing as the population ages. 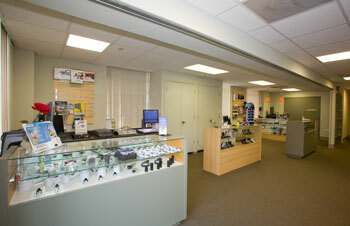 Ms. Jacko says studies show one in four adults over 75 will experience uncorrectable vision loss. “They need to relearn how to use a computer, cook, put on makeup, label clothing, do laundry, cross the street safely with a guide dog, do their shopping, among other things,” says Ms. Jacko, who speaks from experience. A former university executive, she originally came to Miami Lighthouse as a client determined to learn how to continue to be a successful administrator. Her success as chief executive of the nonprofit speaks eloquently of the effectiveness of its programs. “When I began at Miami Lighthouse 10 years ago,” she says, “we were serving about 450 people annually. Now we assist over 15,000. That’s because the need is great. receive the award from Joe Jimenez, vice president for legal and regulatory affairs of the sponsoring Codina. Miami Lighthouse was honored at the Florida Blue Foundation’s 2015 Sapphire Awards as an outstanding nonprofit organization in community health care in recognition of distinguished leadership, innovation and achievements in community health. Penny Shaffer, Market President at Florida Blue, said "The Sapphire Awards embody our desire to recognize excellence among organizations, programs and individuals that have made a significant, positive impact on health-related outcomes for Florida's at-risk people and communities. 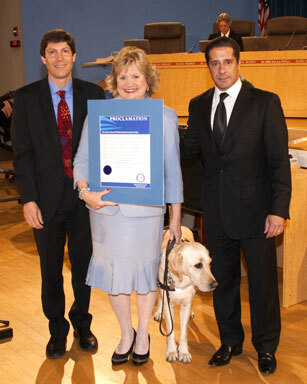 Miami Lighthouse for the Blind has demonstrated excellence and serves as a model for others to emulate addressing their community's needs with unmatched dedication and courage." Finalists were selected by an independent panel of experts with state and national expertise in community health best practices. The announcement was at the Sapphire Awards Symposium luncheon on April 23, 2015. 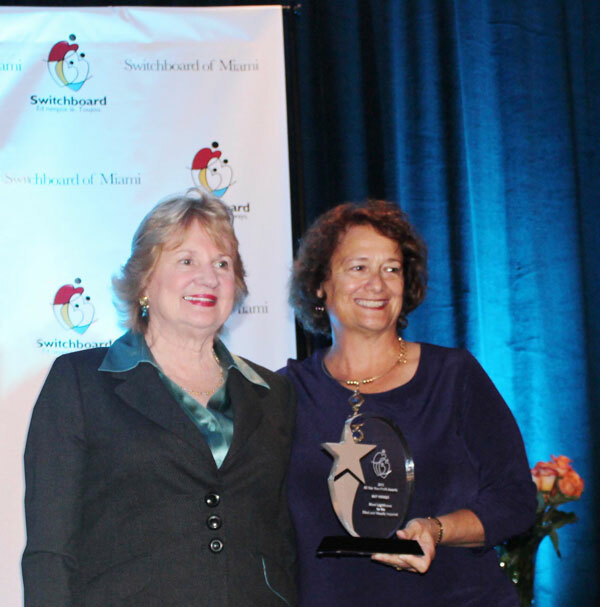 Miami Lighthouse is honored to have received such distinguished recognition. Click here to view the Sapphire Award video. William Beckham, Miami Lighthouse Board Director; Steven Marcus, Health Foundation of South Florida President & CEO; Penny Shaffer, Market President for Florida Blue; Virginia Jacko, Miami Lighthouse President & CEO; Ray Casas, Miami Lighthouse Board Chair. The Beacon Council has announced that Miami Lighthouse will be the recipient of its Distinguished Award for Education at the 13th Annual Beacon Awards. 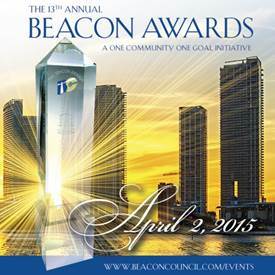 The prestigious awards, cited by the Beacon Council as "A One Community One Goal Initiative," are sponsored by major corporations and financial institutions in the Greater Miami area and recognize outstanding contributions to the community by individuals, non-profits and various organizations. CEO Virginia Jacko will accept the award for Miami Lighthouse at the annual event on April 2nd at the University of Miami. 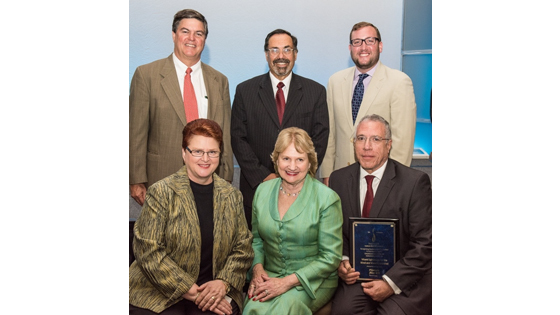 CEO Virginia Jacko was honored as a Community Champion by Molina Health Care of Florida on May 29, 2014. The recognition included an award of $1,000 to Miami Lighthouse which was earmarked for our Owen S. Freed Job Placement Fund. The event honors the unsung heroes who work in our communities and inspire others through their selflessness, extraordinary service and contributions, which positively affect the lives of those around them. 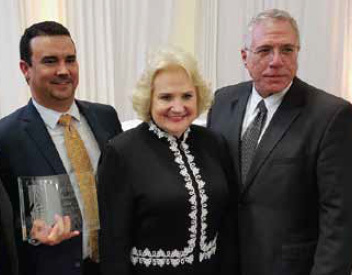 This award was established to honor the memory of Molina Healthcare’s physician founder, Dr. C. David Molina who believed in community partners working together to create programs that would help care for those in need. Lisa Brassill and Liza Ortega Community Engagement Team for Molina Health Care with Virginia Jacko. Board Director Donna Abood was chosen as the 2014 Businesswoman of the Year in the Outstanding Corporate Leader category, and CEO Virginia Jacko was chosen as Businesswoman of the Year in the Public Servant/Non Profit Professional category. CEO Virginia Jacko and Catherine Penrod, CEO Switchboard of Miami. The highest honor Purdue University bestows upon its graduates who have held significant leadership positions is to be called an "Old Master." Selected from a list of 400 nominees, CEO Virginia Jacko was one of ten distinguished alums honored at the 2013 Old Masters recognition ceremony at Purdue in November. The Miami Lighthouse for the Blind and Visually Impaired Better Chance Music Production Program™ has been awarded a grant by The Mockingbird Foundation, an all-volunteer nonprofit organization founded by Phish fans, supporting music education for children. Click here to read press release and biographies of honorees. Miami Lighthouse's Heiken Children's Vision Program wins the bronze medal for their service to thousands of under-served children in public schools at Miami Today Gold Medal Awards Ceremony. Click here to view the article in Miami Today. and Michael Gittelman of the Bascom Palmer Eye Institute at the University of Miami. In an interview with South Florida Business Journal CEO Virginia A. Jacko remarked on the importance of community partnerships in bringing eye wellness to as many people as possible: "You cannot do this alone...you need to grow and maintain key collaborations. Click here to read the South Florida Business Journal article announcing the award. 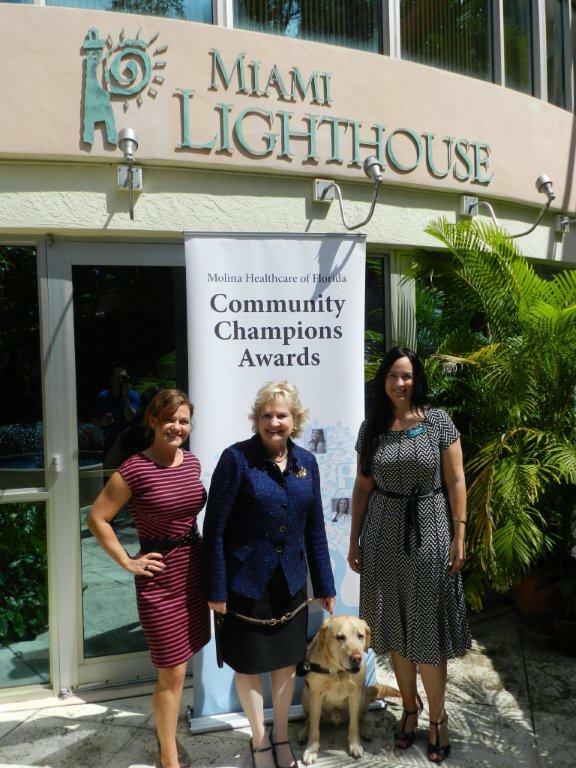 "The award is a reflection of Miami Lighthouse's growing presence in the community and our strategic plan beginning in 2006 to become a recognized Center of Excellence in Low Vision Rehabilitation," CEO Jacko said. In the 2010-2011 school year, the Miami Lighthouse Florida Heiken Children's Vision Program performed 7,950 eye exams for children from low-income families who have no other resource for eye care. Nearly 6,000 of those children received free eyeglasses through the program. University research has indicated that low vision is a factor in poor school performance and resulting delinquency, and receiving vision correction as early as possible helps kids succeed in school and in life. The Miami Lighthouse Florida Heiken Children’s Vision Program, through a contract with the state Department of Health, now brings eye wellness services to children in 42 Florida counties. CEO Virginia Jacko, and Superintendent Alberto Carvalho. from Irwin Siegel Agency, Inc.
Isabel Chica has worked at the Miami Lighthouse for the Blind and Visually Impaired since 2003. Isabel has two sons who are visually impaired. This aspect of her life left her with a fierce passion for serving children who are blind or visually impaired as well as give others the hope, confidence, and tools they need to help their children. With Isabel’s help, parents have learned how to advocate for their child. Her knowledge of early child development has enabled her to teach these parents how to understand age-appropriate cognitive, fine and gross motor skills in order to help their children enter school without suffering long-term developmental delays. Isabel manages the children’s department at Miami Lighthouse. In 2003, the blind babies program served 60 blind babies and their mothers. In 2009 that number increased to 205. Isabel was instrumental in advocating for and starting weekly playgroup sessions where children participate in different playgroups stimulating their fine sensory motor skills and developing their social skills. Parents also participate and learn different techniques to further stimulate their child at home. The play group was featured on NBC in June 2010. Isabel’s collaboration with parents, caregivers and teachers has led the Summer Training and Recreation Program (STAR) to be a huge success. STAR is a fun and educational experience for the children who participate. Ms. Chica holds a Bachelor’s degree in Education, a Master’s degree in Reading Education, she completed the VIISA Program curriculum for family centered intervention for infants, toddlers and preschoolers who are visually impaired as well as INSITE; a resource curriculum for use with families who have children ages 0-5 who are deaf, hearing impaired, blind or visually impaired with additional disabilities. Isabel’s extensive education has enabled her to research and implement an evidence based curriculum for children ages 5-13. Isabel has not only worked with over 200 families seeking professional guidance, she also provided in-service trainings to more than 125 professionals who are visually impaired or blind. Isabel’s warm, charismatic spirit welcomes others to express their concerns and ask for advice. Her experience and wealth of knowledge shines through when she speaks to parents. She is highly creative in developing material for playgroup and is deeply committed to helping children achieve independence. Isabel is always willing to go the extra mile, and is full of love and compassion for her job. Isabel sees people for what they can become and she tirelessly dedicates herself to ensuring each child lives up to his/her ability. Click here to download featured PDF file. John O'Rourke III, Chairman, Coral Gables Chamber of Commerce at the 2010 Coral Gables Chamber of Commerce Award Luncheon. 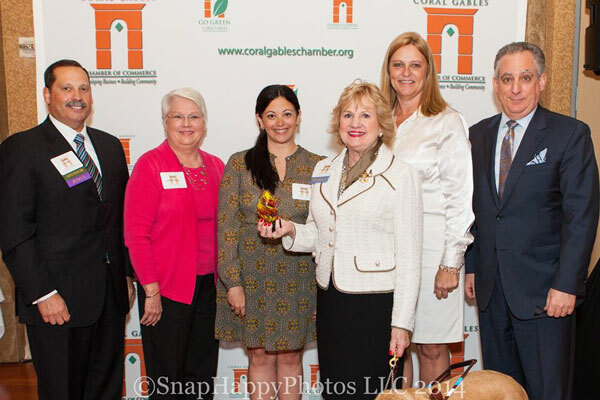 The Diamond Awards were created in 1997 by the Coral Gables Chamber of Commerce to honor excellence in Business. The criteria used to judge applicants are excellence in business achievement, corporate citizenship, customer service and workplace environment. These attributes show a commitment to providing exceptional products and services, while accepting the responsibility to address the many needs in our community. Congratulations to Chairman Owen Freed. 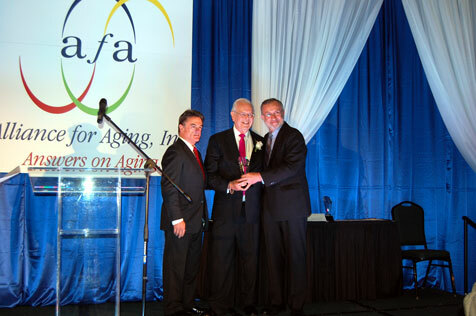 He was awarded the Alliance for Aging President's Distinguished Service Award for Excellence at the Positive Living Awards Dinner. He is the inaugural recipient of this honor. Under Owen's leadership, the Miami Lighthouse has truly moved to the next level, and we have great admiration for his leadership of the Miami Lighthouse. In addition, he has provided outstanding service to the Rotary beginning in 1964 as founding chairman of the Rotary International 6990 Youth Exchange. He currently serves as coordinator of the Alumni of the Rotary Foundation for Zone 34; he also currently serves as a member of the FIU Advisory Board for the School of International and Public Affairs among many other public service appointments also including Honorary Consul of Honduras since 1968. We all extend our congratulations to Owen. Congratulations to Board Director State Representative Yolly Roberson who is the recipient of the Miami-Dade County In the Company of Women Award in the category of Outstanding Woman in Government and Law. These awards recognize local women from various disciplines for their outstanding achievements and contributions to the citizens of Miami-Dade County. The award was presented at the 22nd Annual In the Company of Women Awards Ceremony on March 18th. 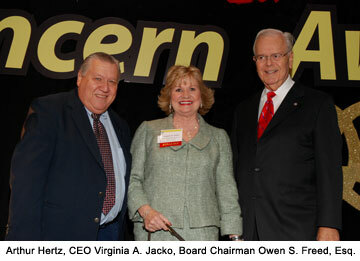 CEO Virginia Jacko received the prestigious 2008 Concern Award recently from Health Foundation of South Florida. The award includes a $25,000 grant to the charity of the recipient’s choice; naturally CEO Jacko’s choice is Miami Lighthouse. 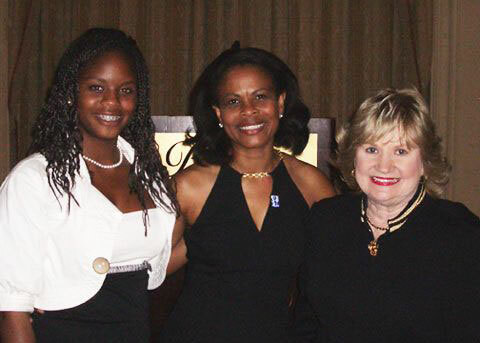 She was nominated for the Concern Award by Arthur H. Hertz, CEO of Wometco Enterprises and Miami Seaquarium. This year, both Concern Award winners lead organizations that help people who share their own disability. CEO Jacko lost her eyesight to retinitis pigmentosa; the other award recipient, Pedro Rodriguez, founded Spinal Cord Living-Assistance Development after his own spinal cord injury. ''I know about a lot of awards programs,'' said Steven Marcus, CEO of the Health Foundation. “I think this is the only one in the United States where the award winners head up organizations that offer services to people who share their disability.'' More than 300 community leaders were present at the awards luncheon in December.